Leaving Dunblane we followed the A85 north and west for several hours, until we made it into the heart of the southern highlands. 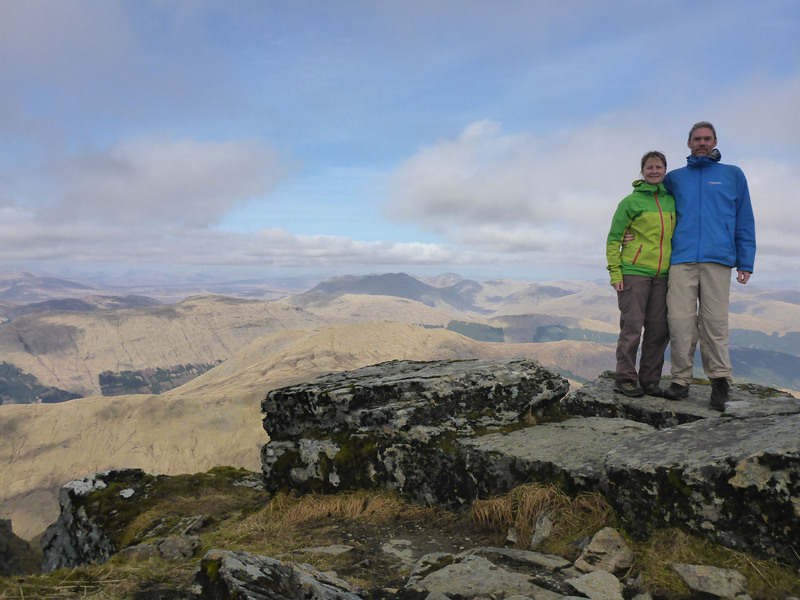 We stopped at Glen Lochy car-park, with the intention of climbing the munro Ben Lui the following morning. There was a picnic table on a small rise that offered a peaceful spot to view the north face of the mountain from, in between the brief moments when the low clouds dissipated enough to allow a view. We had a huge lie-in, exhausted from the recent hectic visits and late nights, so were slow to rise. The wet weather cleared up nicely, so it was worth us waiting until later in the day to begin, as we avoided the early rain. We forded the river then passed under a low, short bridge to cross under the nearby railway line. The path cut through some managed forests with lots of recently cut trunks stacked in neat piles, ready for collection. We proceeded along the wet and boggy path, taking careful steps in an attempt to keep our feet dry for as long as possible. When we reached the end of the tree line, the path ran out and so we had to simply make our way up the steep grassy mountainside as best as we could. It was a long, difficult and steep slog for an hour until we reached the low ridge. We passed pockets of snow still gripping to sheltered hollows high up on the slope. The springy moss covering was a delight to walk on, but the gradient was unrelenting. 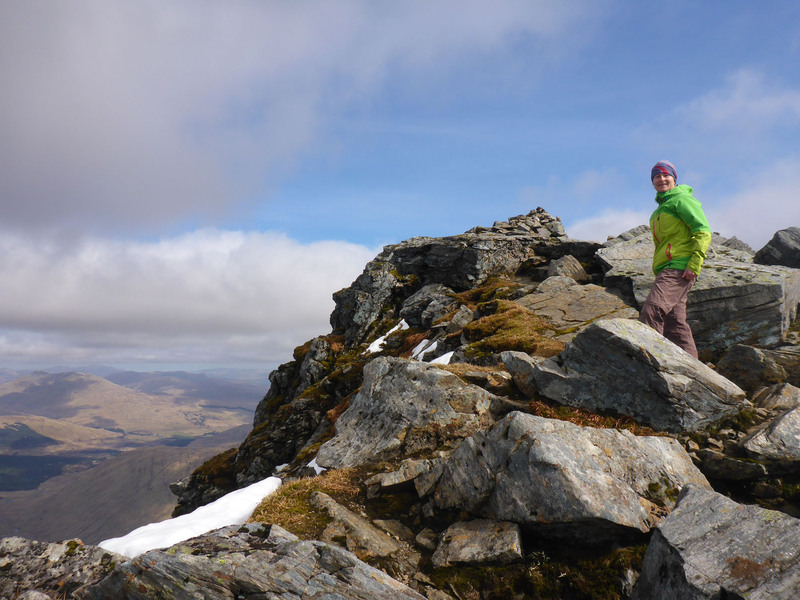 We reached a flat viewpoint that allowed fantastic views in all directions, but we were not yet at the top, so after a brief look we continued up the ridge to the cairn on the south west corner. We passed sheer cliffs sprinkled with ice and snow as we scrambled over rocky outcrops to reach our goal. 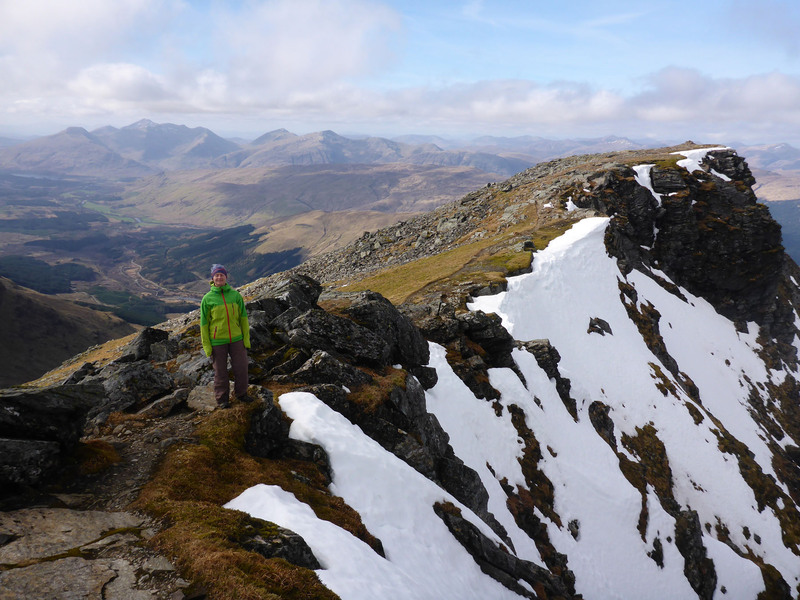 From the top, 1130m high, we were rewarded with full panoramic views of what seemed like half of Scotland; hundreds of similar fawn coloured peaks rising and falling away into the far distance. The only sign of human intervention in the landscape were the unnatural straight lines of the distant A85 and the too-neat truncation of the area of managed forest. All else was natural and wild. We descended by a different route and found an equally boggy path back to the bottom. We spent a quiet, relaxing half hour slowly rinsing out our muddy gear in the gentle flowing river waters. 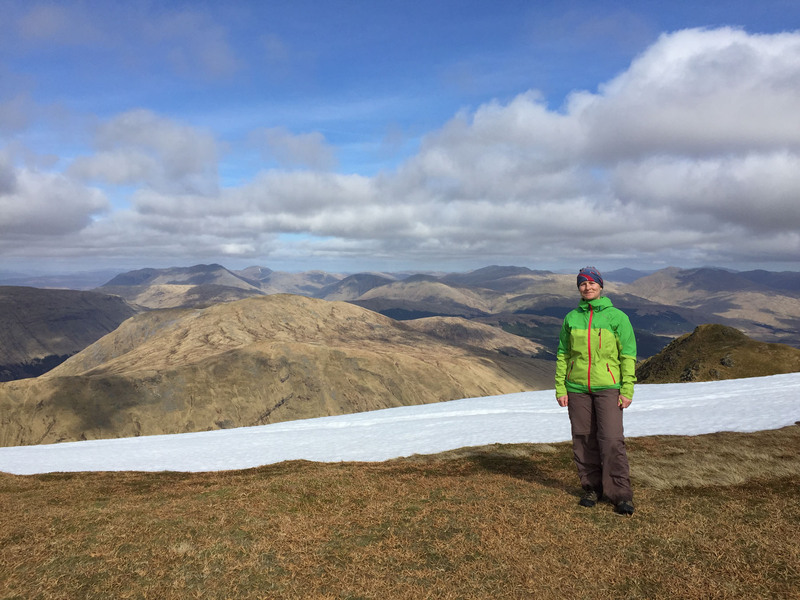 We carried a steaming cup of tea to the raised picnic spot and traced out our route up and down the mountain face, enjoying reliving where we had just been and what we had seen. We passed a second night in the same spot, where we were joined by a few other vans late in the evening. We had a nice conversation with our neighbours in the morning, discovering we both have plans to travel to Norway this summer; maybe our paths will cross again. 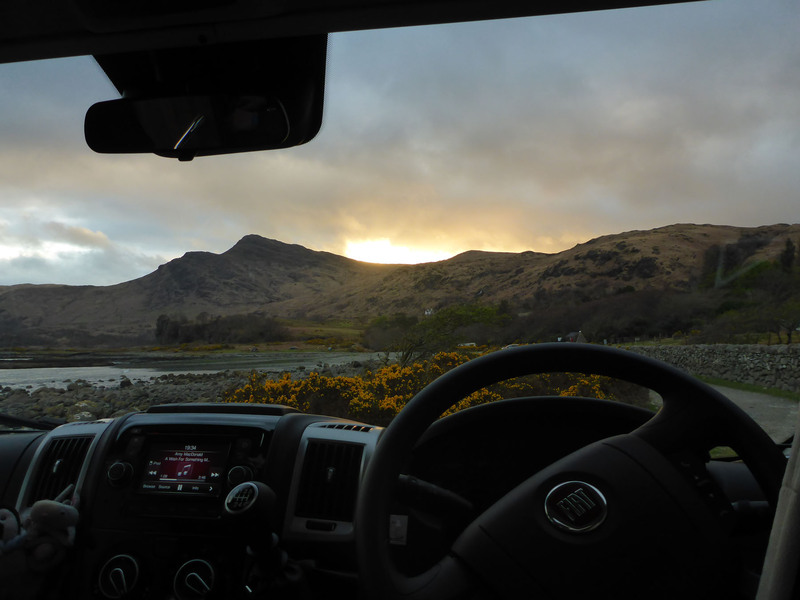 Back on the A85, we doodled along in the direction of Oban where we unsuccessfully checked out a few possible overnight spots, before deciding that our most comfortable option was to stay in the car-park of the Wide Mouthed Frog pub and restaurant. Here we enjoyed a lazy evening and a few very decent ales as we enjoyed their free Wi-Fi. 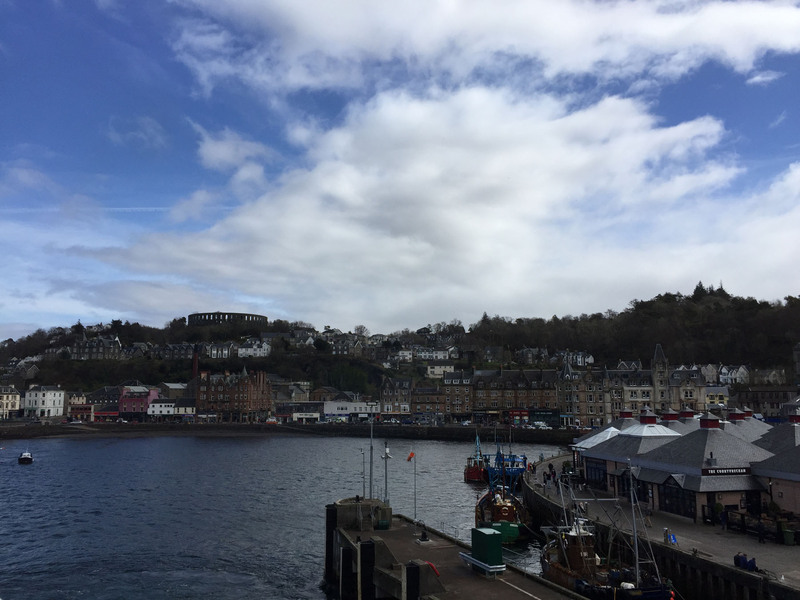 The following morning we stopped briefly in Oban again to have a flying visit around a few outdoors shops, then we hopped on the ferry to Craignure on the Isle of Mull. The crossing was smooth and quick, and arriving on the island for the first time we drove all of one mile into the nearest campsite, Shieling Holidays, so we could fully empty and fill Benny in anticipation of a week or so of enjoying wild camp spots around the rugged coastline. 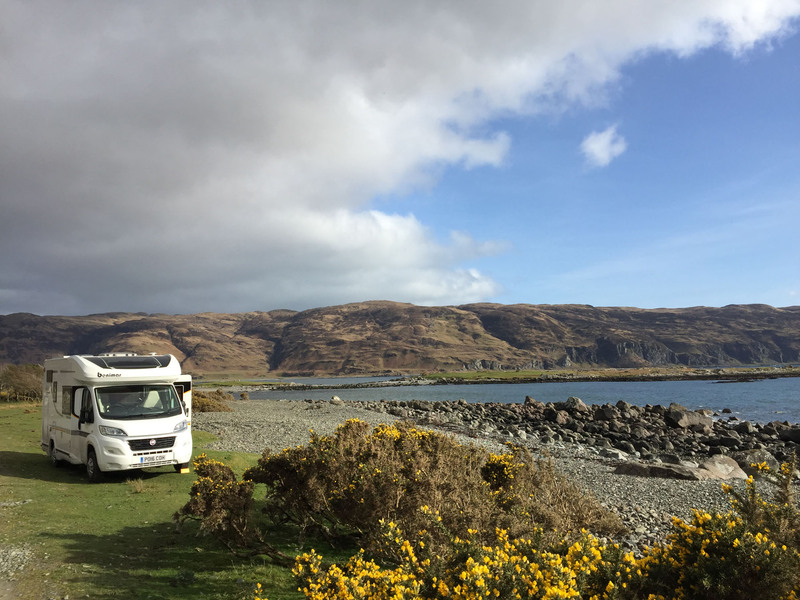 Wild camping may be fine in Scotland, but finding places to service your motorhome is much more difficult than in France or Spain, so official campsites are still an occasional necessity. 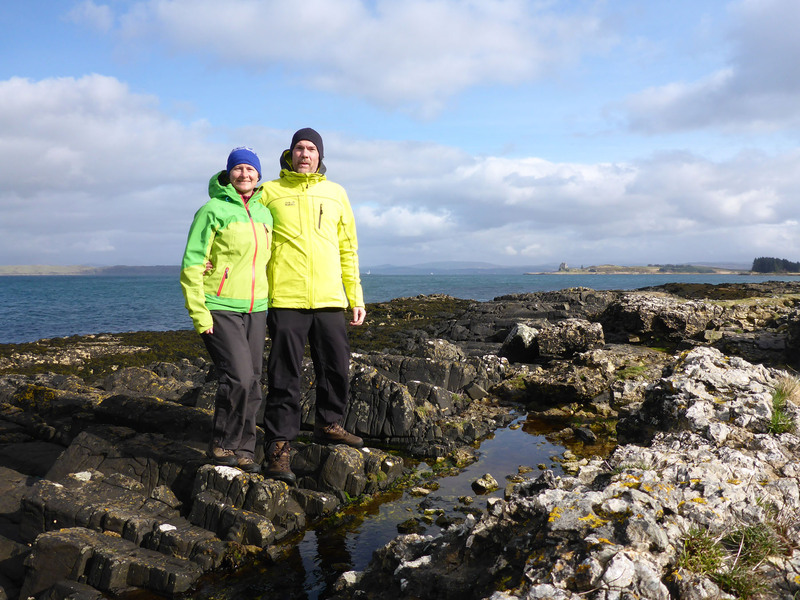 We enjoyed a bracing, weather-beaten walk around the nearby coastline, as we looked out over the nearby islands and watched the next Calmac ferry smoothly pass us in the bay. Then we settled in for a very lazy afternoon and evening of reading, resting and recuperating, our three main objectives for this peaceful, slow-paced west coast trip. The following morning we headed off, turning right out of the campsite and following the main road on Mull along the coast in the direction of Tobermory. 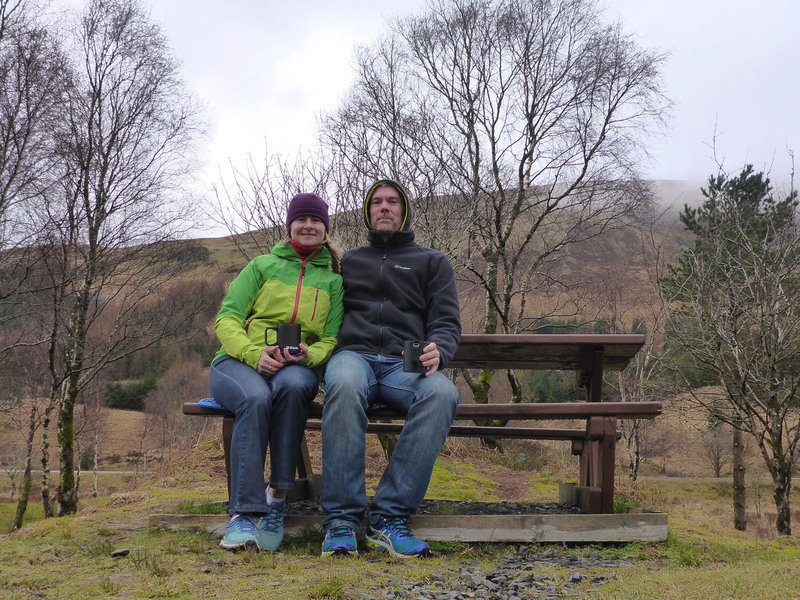 We stopped in several picnic spots to check out the coastline views, before reaching Salen where we turned left and followed a long loop around the base of Ben More, via Killchronan and Loch Na Keal. We passed cows and sheep on the narrow, single track road, stopping occasionally to allow faster vehicles to pass. 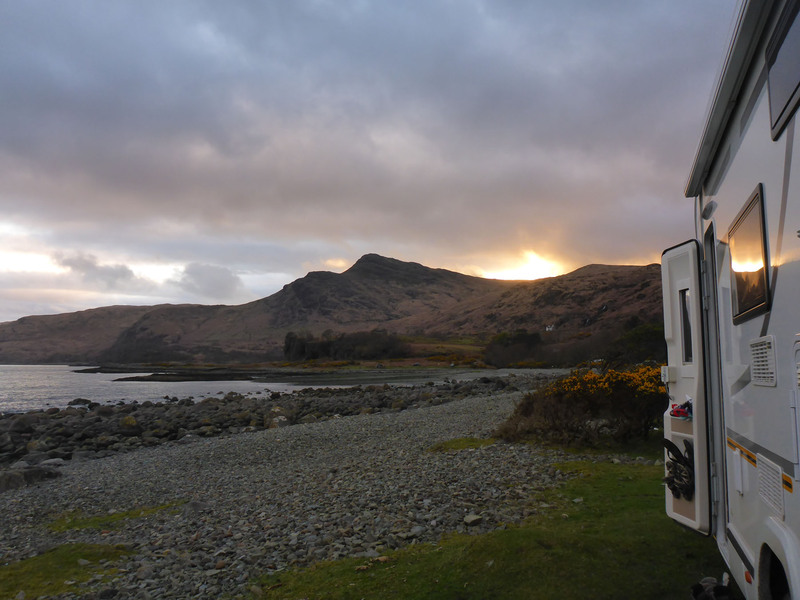 We noted very few sensible and non-intrusive places to wild camp on this route, as the roads were too narrow and the grassy verges too wet and boggy at this time of year to risk. We noted two potential spots should we need them later, but we pushed on around the loop, almost back to Craignure, before turning right at Loch Spelve to follow the even tighter, almost claustrophobic track down to Loch Buie. The route was lined for long stretches with huge bougainvillea bushes, tall and overhanging, that were just beginning to flower in places and we imagined how impressively colourful it would be in a few short weeks. Instead we had bright rows of daffodils lining the verge providing our colour. Thankfully we only faced one other vehicle on this stretch of road, and it was a tight squeeze to pass, even with the designated passing place. Finally the winding road reached Loch Buie, a protected bay deeply recessed from the main coastline, with a dark, pebbly beach curving around the small hamlet. We parked on a grassy verge side-on to the beach with a fantastic view out to sea. 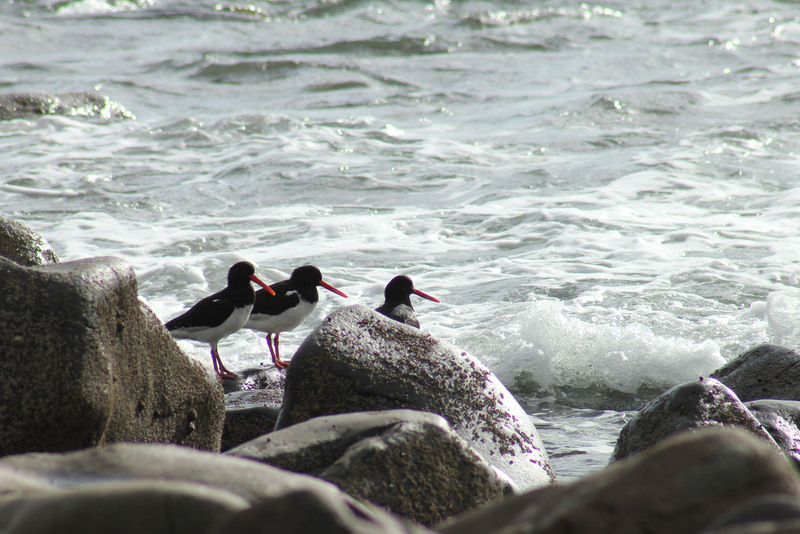 We had pebbles extending beyond our grassy standing, which gave way to larger, smooth boulders that met the calm sea. We cast our eyes around the bay flanked by beautiful mountains, a mixture of exposed dark, rugged granite and orangey bracken covering that made a pretty backdrop against the lush spring grass, the pebbly beach and the clear blue water. A small, well-stocked honesty shop called ‘The Old Post Office’ sat open on the corner near us; a very useful service had we forgotten any essentials. Very happy with our spot for the night, we got our walking boots on and explored the local coast, heading east towards Castle Mor. 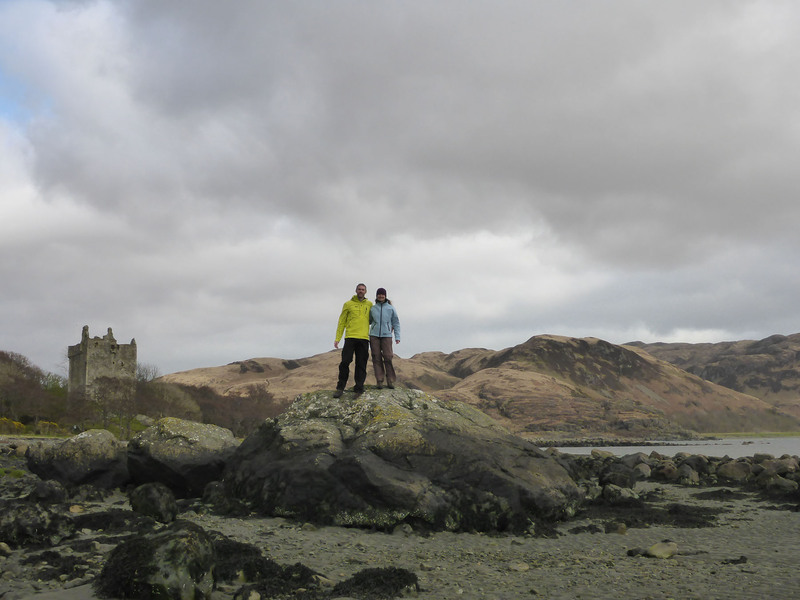 We walked along the path at the top of the beach, enjoying playing on the rocks and looking across to the simple square-towered castle in the distance and sandy beaches occupied with highland cattle beyond. The next morning, despite the light drizzle, we walked the opposite way around the coast, in the direction of Carsaig. 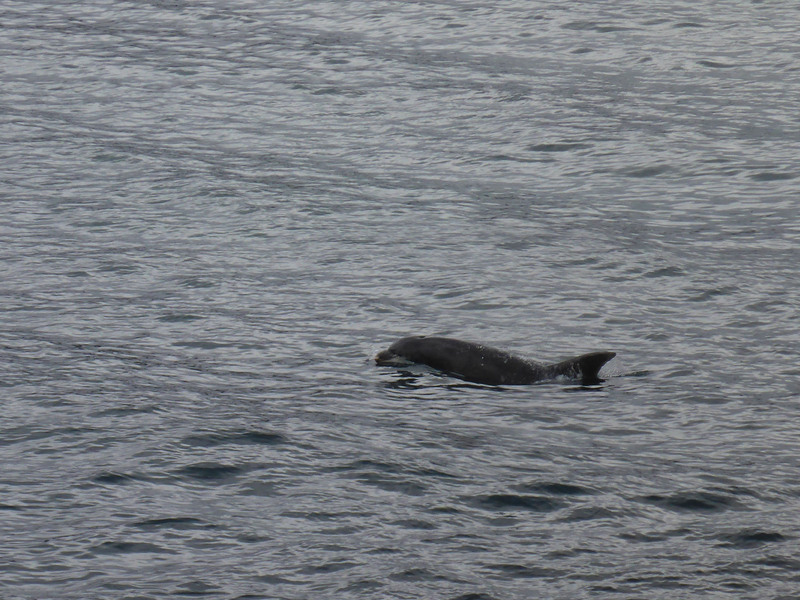 We made just beyond Glenbyre when we suddenly spotted dolphins in the water. They were in small groups of three or four at a time, maybe twenty or so in total, heading into the Loch. We spent many minutes watching them pass before deciding to follow them back as they were being shadowed by a huge bank of dark muddy cloud that spanned the width of the whole loch. It ended as a shorter walk than planned, but having seen the dolphins more than made up for it. We spent a second night on the same beach, never boring of looking out to sea, amazed that none of the other motorhomers we’d seen had made the trek out to this little part of the island; we felt quite selfish, but privileged, to have it all to ourselves. We drove back along the narrow road out from the Loch, again happy to only have one oncoming car to pass on the way. We headed west to Loch Beg and Pennyghael, and then onwards to Bunessan, where we detoured south to Uisken to see their beach. The road down was terrible, the narrow surface all ripped up and the passing points a sea of mud, so we were very glad not to face any traffic coming towards us. We stopped only for a few moments on the scruffy beach before retracing our steps and turning west to the ferry port at Fionnphort, where we planned to catch the short ferry to Iona the following day. After a quick look, we headed south out of the village to Fidden where we camped on the edge of a wide grass mound overlooking neat sandy beaches and a shallow, turquoise sea; an absolutely stunning spot for a few chilled days. 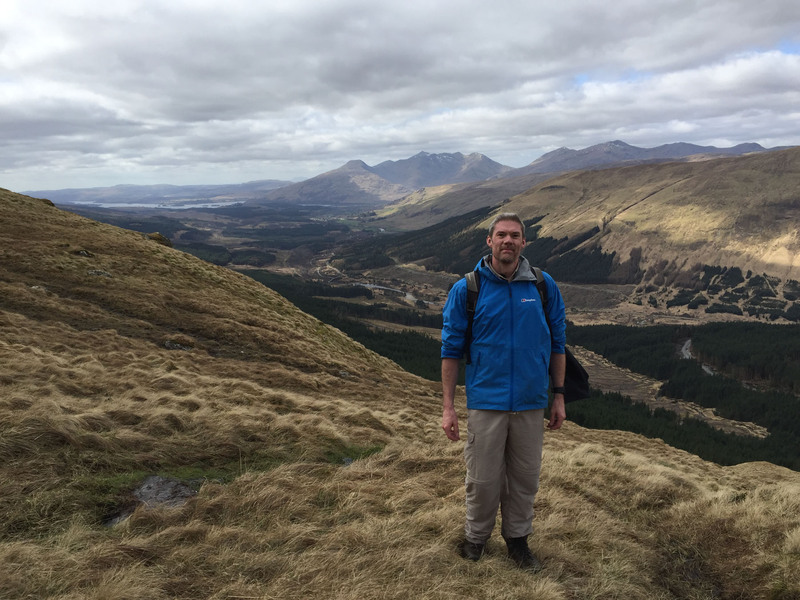 This entry was posted in Hiking, Our Travel Journal, Scotland on Apr 11, 2017 by Aaron Hill.